We spent a lot of time deciding on our flooring, from the flooring material to the look to the shade. At the beginning, Richmond really wanted to install bamboo flooring. It's eco-friendly, is hard as nails and looks really nice. 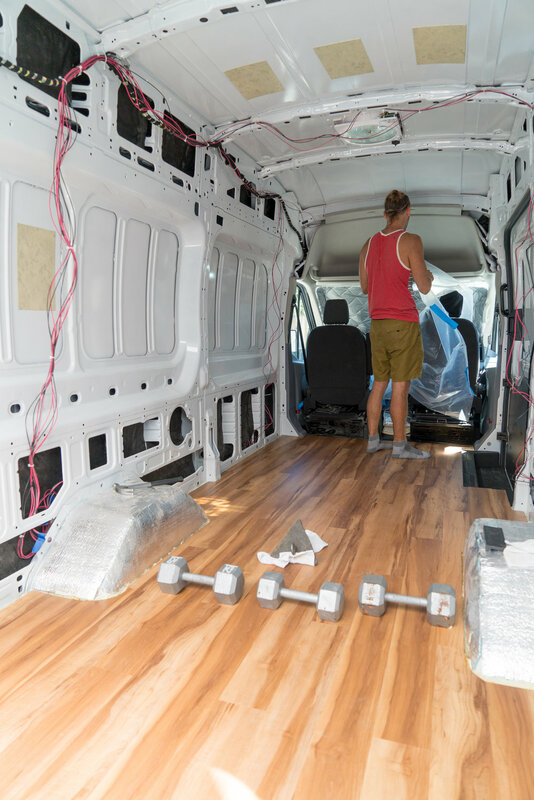 Jules was lukewarm on this idea (because of the limited selection of colors/tones) and mostly went along with it until the flooring experts we talked to all thought it probably wasn't the right material for a van. So we ditched it. See below for more! We're not knocking those who have done bamboo, we just aren't that brave. From all the research we could do and all the people we talked to about bamboo, it seems like one of the hardest floors to do right. Bamboo flooring, while it looks really nice, can expand and contract dramatically with temperature and humidity. That being said, engineered bamboo is definitely better (about 3x less movement depending on a lot of factors), but will still move a lot. Near the end we had decided on a couple factors: definitely engineered, definitely high quality and definitely glue down install. 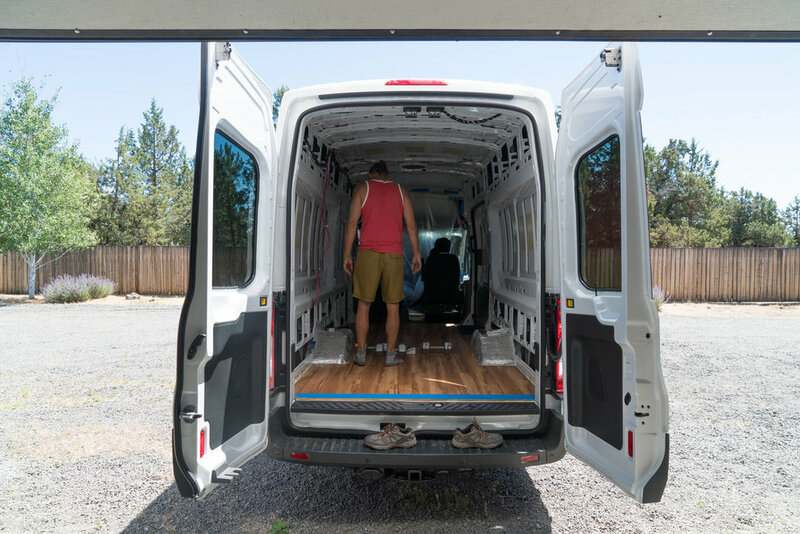 We ran this by more flooring experts who agreed that would for sure work in a house or anywhere that didn't see massive changes in temperature and humidity, but was very wary about installing in a van. In fact he basically said don't go with bamboo, you'll probably regret it. In the end, we decided on a luxury vinyl flooring tile that is about as eco-friendly as you can get with vinyl. We chose to go with USFloors Coretech Luxury Vinyl. It's made with a core of recycled bamboo, recycled wood and repurposed limestone waste (the dust from cutting limestone). It comes with a cork backing, which is also eco friendly and means you don't have to do any underlayment on your floor. It's still vinyl, but if you're going to go with vinyl, this product seems pretty good. 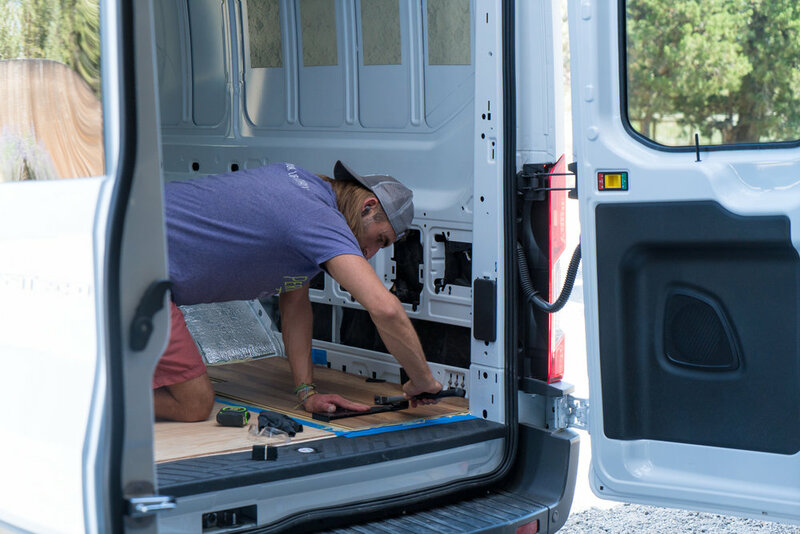 Another selling point for us is that the recycled limestone significantly lowers the amount of expansion/contraction, which is really good for a van. We travel to a lot of different climates and that was probably the biggest worry with bamboo. If you're changing the humidity and temperature significantly, it just seemed too risky for us to try. Floating floor or fixed floor? Now, on to how to actually install the floor. Most people, especially in houses, install this floor without adhesive. This is called a floating install since the flooring is able to move and expand. We decided to use adhesive this time around, since we were advised to use the float method last time but then had some issues with the floor bowing when it was in direct sunlight (which made us add a bit of glue in the worst places). We really wanted to be safe this time. With this particular product (installed in a stationary setting), the glue down method increases the temperature range in which they will warranty the product (above 140F! ), so that gave us another clue that it was probably better to glue it down. We highly recommend going to a flooring store to buy your material. We went to the big box stores and looked. When we weren't sure about which type to use, we decided to go to the specialty flooring stores to see what they had. We went into a local shop, told them about our project and they immediately were trying to help us make the right choice. It's sometimes hard to tell who's just trying to sell you something and who's actually interested in getting you the best product, but we found someone who had actually used multiple materials, knew the benefits and struggles with a few and gave some sound advice on not biting off more than we were willing to fix later. It probably saved us a lot of grief. Also when you buy your material, make sure you have enough. Our floor will be a bit less than 75sqft. We bought 84sqft and barely had enough to finish. With all the cuts and a few mess ups, it's better to get a bit more material than you need. It's also important to get the right tools. You can find the list of what we used at the top. You want to start with a clean, flat surface to apply your floor. 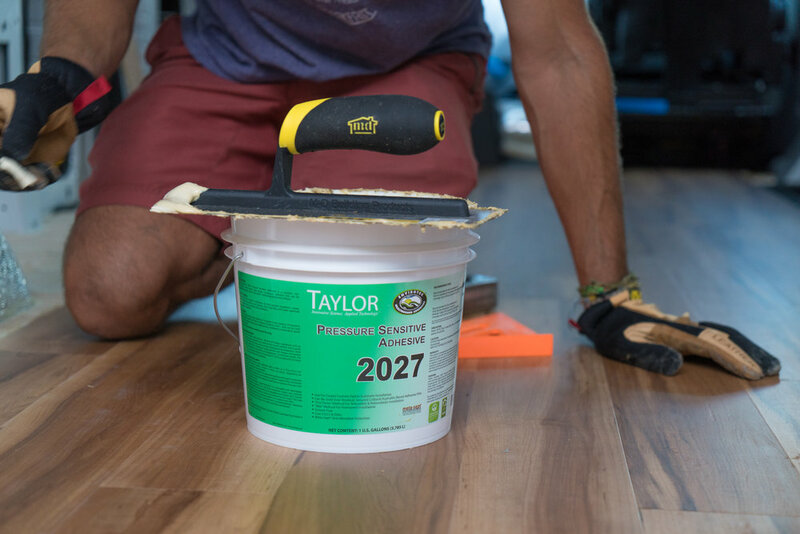 Follow the instructions on the adhesive and the vinyl flooring to make sure that it's ready. Check out our post on subfloor installation! One thing to note is that the floor needs to be within 3/16" flatness for the vinyl flooring. Choose how you want to install your floor, or if there's any kind of pattern you want to follow as you go. It might change the way it looks in the end. We went with a pattern that repeated every three boards. It makes it look like the boards were placed more randomly and makes the joints between boards stronger. It's also recommended to make sure all your cuts are done and tested before starting the glue process. Once the glue is down the time crunch starts and it's nice to have all the pieces ready beforehand. This is also a great time to try out your tools and how everything will fit together. It's much easier without the glue, so practice until you feel like it's easy before starting the real thing. It's easy enough to take them apart after. You can watch this video (insert link) to get the best techniques on fitting these together. This will be helpful before you start actually gluing in the floor pieces permanently. Don't want any misalignment or gaps in your new flooring! Spread the glue evenly in the area that you've taped off for flooring application. Make it about 1/16" thick and follow the instructions on the packaging. The less glue you put down, the more coverage you get out of your glue. 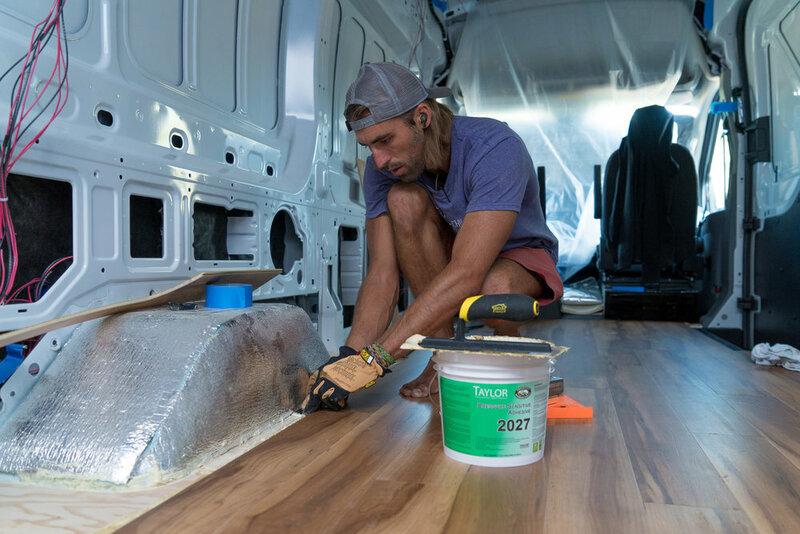 Gently apply the vinyl flooring on top of the glue, fitting the tongue and groove together. If you have a wall at one edge, use spacers to prevent the floor moving when you are using your pull bars and hammer. We also used weights since the front and the back have no wall to place spacers. 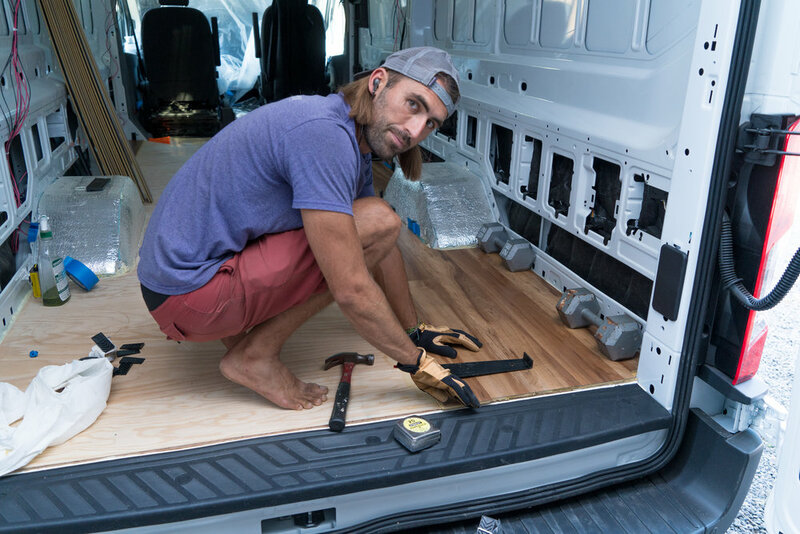 If your boards move, you can always use your pull bars to get them back into place, but it's better to make sure they don't move. This part can be frustrating in a van. I mean, just look at Richmond's face in the lower right photo...haha. But it's necessary so that there are no gaps between your floorboards to hammer away at these things for a while. This process also gets easier as you go along. We really recommend practicing before using glue until it feels easy. Glue makes everything a sticky mess. If you feel any movement in areas, there is air underneath the floorboards. Squeeze it out using a roller and add weight to make sure it doesn't come back up. This is where glue helps and hurts. Once it's dry, it won't move, but it can also trap air. Make sure all the air is out before letting the glue dry. 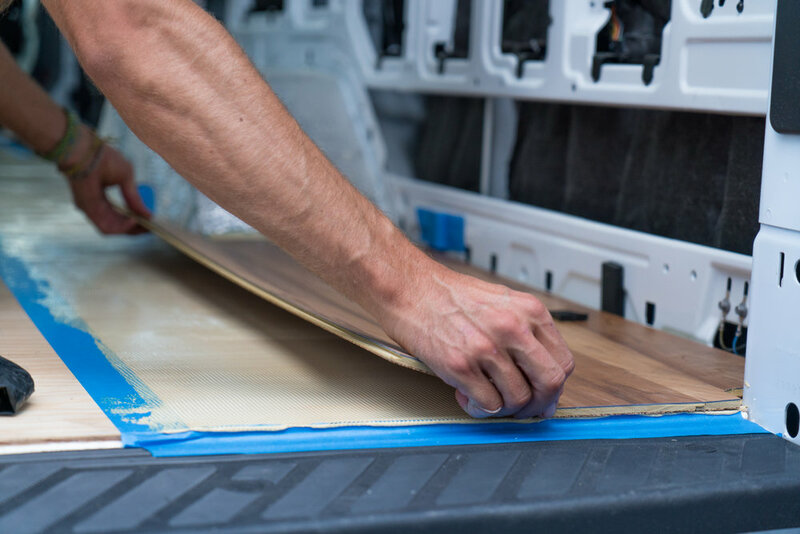 Once everything is dry (follow adhesive instructions for dry time), you can seal the edges with your favorite sealant. We used clear silicone. It's a great sealant, is super flexible and is easy to apply. Looks beautiful! We'll be adding trim once all our built ins are installed, but for now the floor is finished!